Quinton Rose (left) and the Owls will look to control the pace of Tuesday's NCAA play-in game against Belmont. DAYTON, Ohio — Temple’s 9:10 p.m. play-in game Tuesday against Belmont at the University of Dayton Arena will be all about tempo. The Owls (23-9) have to draw that fine line between not wanting to slow it down, but also not preferring to get in a track meet with the Bruins. Belmont (26-5) is the second highest scoring team in the country, averaging 87.4 points per game. Belmont is 15th nationally in possessions per game with 76. Temple is 95th with 72.8 per game. 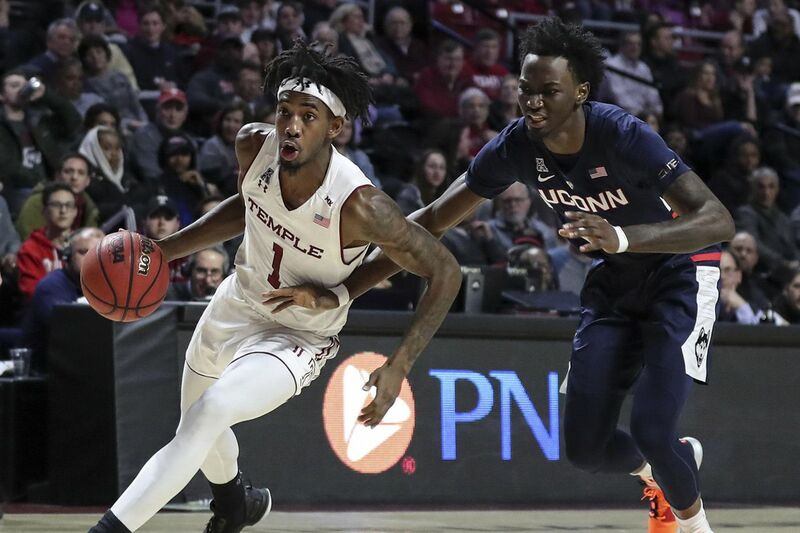 The Owls’ Quinton Rose is their best player in transition. So Temple, as Dunphy pointed out, doesn’t want to totally slow a game down. Rose’s drives to the basket will be a key. Belmont puts so much pressure on teams, that the Owls have to do the same on the other end. “I definitely have to look to get to the basket against them,” Rose said. The key will be getting back on defense and not allowing shooters to get open looks. In each of the last three games, the Owls have been hurt by one of the opponent’s three-point shooters. It began in a 78-71 win at UConn on March 7. In that game, the Huskies Christian Vital shot 7 of 11 from three-point range on his way to scoring 26 points. Then, in a 67-62 victory over Central Florida, Aubrey Dawkins scored a career-high 36 points, shooting 6 of 11 from beyond the arc. Finally, in Friday’s 80-74 quarterfinal loss to Wichita State in the American Athletic Conference quarterfinals, 6-foot-8 Markis McDuffie scored a career-high 34 points and shot 4 of 9 from three-point range. All three of those players had their share of open threes. So the Owls have to guard the three, but also get back in transition defense and not allow Belmont to get easy buckets. It is a difficult task, but the best defense could be a good offense. Temple has to put the type of pressure on Belmont that the Bruins have been putting on opponents all season.